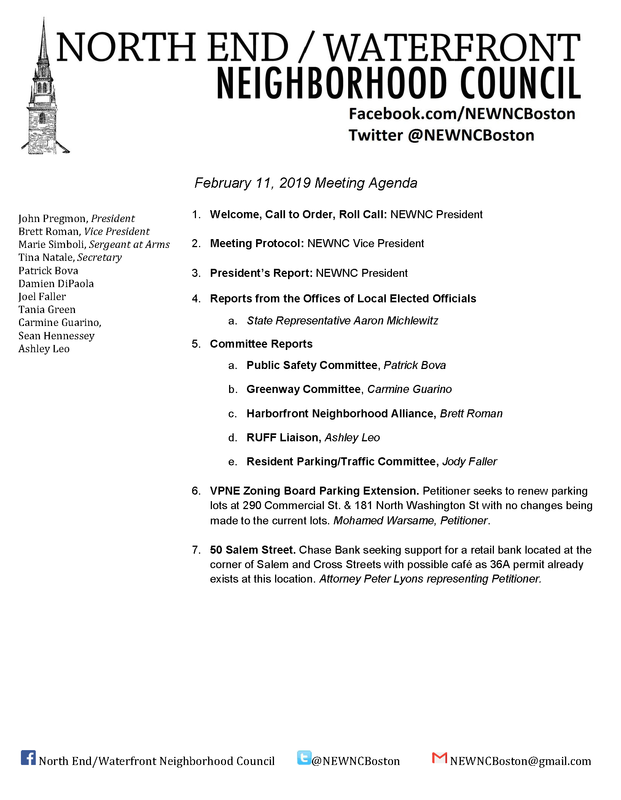 The North End / Waterfront Neighborhood Council (NEWNC) will hold its monthly meeting on Monday, February 11, 2019, at 7:00 p.m. at the Nazzaro Center, 30 N. Bennet Street. At this month’s meeting, the Council will hear a petition for Chase Bank to open a retail bank and possible cafe at 50 Salem Street, formerly Peet’s Coffee. There will also be a petition for the renewal of the parking lots at 290 Commercial Street and 181 North Washington Street. See the full agenda below. Ugh! A bank is not what is needed – especially at the entrance to the North End. A bank is probably the only business able to afford the rent. hoping a Hardware Store would go in, which we need desperately. Charlestown Ace Hardware Store was looking to go in on Salem St. until there was a change of plans to divide the True Value space into 3 separate rentals. I heard this, don’t know how true it is, but what a great loss. I agree Joan, a bank is not the most attractive face to have at the entrance to the North End ( no offence Chase, I am a customer) and a Harware Store like the Salem St. TrueVaule would be a better choice. Unfortunately the hardware on Fleet St. didn’t expand to fill in the gap. It appears that walk in business such as restaurants, cafes, fashion and gift shops haven’t had much luck there. It appear that only destination businesses such as banks and hard ware stores could make enough to deal with the ever increasing rents. Hope someone comes up with a good idea.